One afternoon back in the 1980s, I was bowling along a German autobahn in my Datsun Bluebird coupé having spent a pleasant week in Bavaria with some German friends. The car was a real little stunner, a rich brown colour with a cream vinyl covered roof and a tasteful go-faster stripe along each side. It was a big hit everywhere in Bavaria and someone even offered to buy it. I was driving on the A61, heading in the approximate direction of Britain. I knew from the road signs that I was near Mannheim and decided to drive into town and find a cheap hotel for the night. So as usual, I looked out for the familiar signs with the word “Zentrum” pointing the way to the city centre but none appeared. After a time the road signs showed that I was heading for Bingen and I had missed the turn into Mannheim altogether. I muttered “Oh bother” to myself (or words to that effect) and spent the night in Bingen instead. 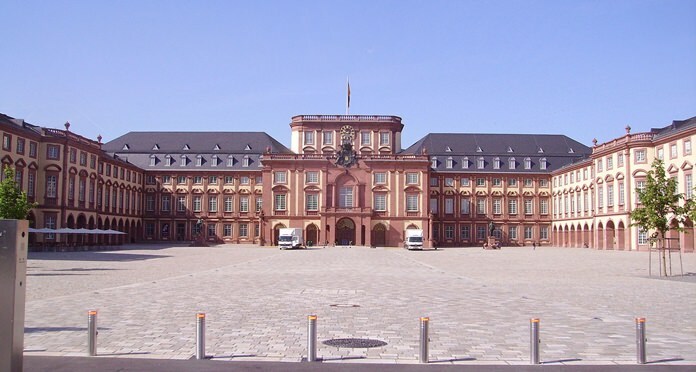 Mannheim is important in musical history and one of the reasons I wanted to go there. In the late eighteenth century, Mannheim had the finest and most famous court orchestra anywhere. It attracted some of Europe’s best instrumental players and composers and was lavishly funded by Duke Karl Theodor. It eventually became known as the Mannheim School, but not a building with classrooms and desks. The term referred not only to the new techniques pioneered by the orchestra but also the group of composers who wrote for it. The composer Carl Stamitz is closely associated with the Mannheim School and his father Johann is considered the founder. Oddly enough, other composers connected with the Mannheim School have since faded into obscurity but Stamitz is particularly remembered for his tuneful and elegant music. The composers at Mannheim introduced a number of novel ideas into orchestral music. The most famous was the sudden crescendo for the full orchestra – a dramatic effect that evidently caused some ladies in the audience to faint. Then there was the so-called Mannheim Rocket which was a quick ascending passage in the melody. They invented the Mannheim Roller, not a fairground ride but an extended crescendo passage with a rising melodic line over a repeated bass pattern. The so-called Grand Pause originated in Mannheim too, a dramatic effect still used today in which the entire orchestra stops playing for a few seconds resulting in complete silence, only to start again, usually loudly and energetically. Carl Stamitz was born in Mannheim and as expected, grew up to follow in his father’s footsteps. By the age of seventeen he was employed as a violinist in the court orchestra and his father must have had hopes for him. However, at the age of twenty-five, Carl left his secure job in Mannheim and began concert tours around Europe. For a time he lived in London. He was a prolific composer, turning out more than fifty symphonies, sixty concertos and a large amount of chamber music. The concertos are noted for melodic appeal and courtly grace rather than virtuosity. Because they are not too difficult to play, many of them are popular with music students today. Despite his musical achievements Stamitz was less successful at managing his finances. The young Beethoven observed that Stamitz was dressed poorly at a concert and looked decidedly scruffy, something that would never have been tolerated in the well-disciplined Mannheim orchestra. For some reason only the first movement of this concerto was recorded but it is worth hearing because of the splendid orchestral playing. The soloist is the Croatian cellist Vid Veljak who was sixteen when this video was made although during the orchestral introduction he occasionally seems slightly bewildered. Stamitz never managed to hold down a job with one of the major royal courts. He returned to Mannheim in 1795 but soon after accepted the post of concertmaster at Jena in Central Germany. It seems that he taught at the university there, but received only a modest income. He began to sink deeply into debt and eventually and inevitably his funds ran dry. Then in January 1801, his wife died. By the following November Stamitz too was in his grave. All his possessions, including many tracts on alchemy were auctioned to pay off his debts. Whether Stamitz was studying alchemy to try and turn base metals into gold, cure some disease or search for the elixir of youth we simply don’t know. But he must have felt pretty desperate. As Doris Day sang a hundred and fifty years later, Que sera, sera. Whatever will be, will be.